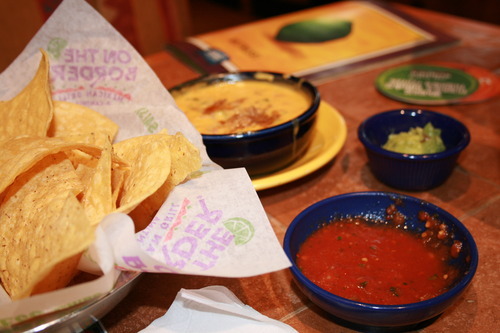 Stepping into the aromatic doors of On the Border, you are immediately welcomed into a small slice of spicy heaven. The spacious room greets you with vibrant shades of blue, yellow, and red, along with a flare of Mexican culture that has you crossing south of the border in a matter of seconds. For a restaurant that is not considered to be fancy or five stars, On the Border takes care of you and offers a wide range of choices that could compete with the best at a fraction of the cost. Similar to the more upper-class restaurants that pass out bread with meals, On the Border offers each table a bowl of fresh, hand-made tortilla chips with their signature spicy salsa that will have you begging for more. The salsa, unlike any other, is one that offers a joy-ride for anyone with an appreciative taste-pallet. Hints of garlic, onion, cilantro, fresh tomato, and crunchy red and green peppers arouse your taste buds with every bite. As for their choice in beverages, On the Border offers all of the expected drink options, and many more for any big kids over the age of 21. 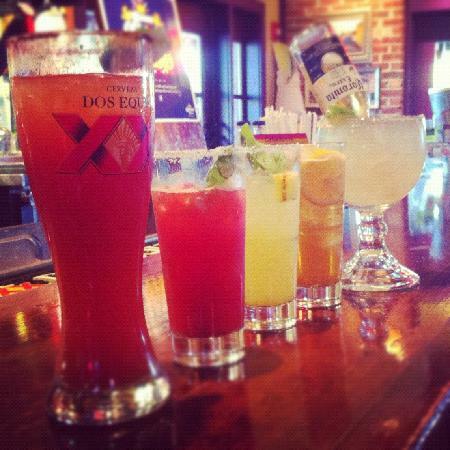 Of course, what would a Mexican restaurant be without Margaritas?, which on Tuesdays, come half off during happy hour! 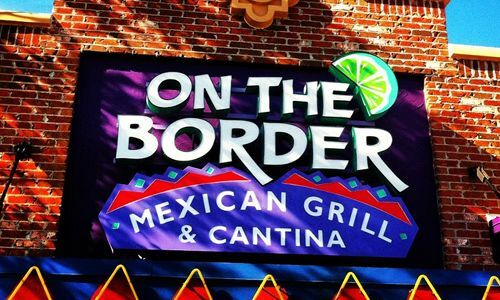 Not only does On the Border have all of the common brand tequilas, like Jose Cuervo and Herradura, but they also stock 1800, Patron, and other top shelf liqueurs such as Grand Marnier and Chambord. Tuesdays allow the average restaurant-goer a variety of delicious choices across the entire menu. One of these delightful deals is tacos starting at only two dollars. These are not your boring, every day Taco Bell tacos, but a selection of freshly pressed crunchy or soft tacos with a choice of seasoned chicken, steak, fish, or barbacoa (pulled pork). Every dish that is served is presented with elegance accompanied with dainty pieces of greenery that make you feel like you are dining with the best. 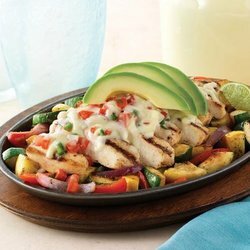 For those who aren’t interested in tacos, On the Border also has a large number of sizzling entrees that come alive and sing a song to your senses. Most ‘fancy’ restaurants get too caught up in what exotic foods they can throw together, that they forget what really matter- how the food tastes. Now, this is not to say that fancier restaurants can have excellent tasting food, but the food is often times so covered in excess nonsense that you no longer know what it was to start with. In contrast, On the Border does not try to hide flavor, but rather enhance the original essence of the meat with fresh vegetables that are pan-seared to perfection. No restaurant review is complete without a look into the dessert menu. I’m happy to say that while On the Border does have more familiar dishes, like Kahlua ice cream pie, they also have authentic Mexican desserts such as sopapillas and flan. Though I am not the biggest flan fan, I can say they do not disappoint; each bite is a smooth, rich, and heavenly caress of the tongue. 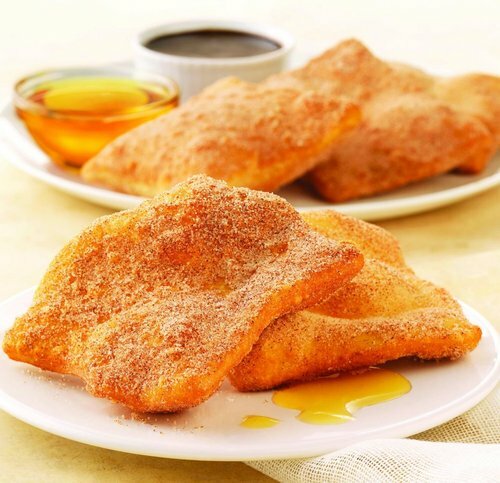 The sopapillas, a definite favorite, provide a welcoming warmth of flaky, cinnamon-infused mouthwatering goodness that reaches the soul. Though a Mexican chain restaurant may seem unworthy of such high praise, On the Border offers each restaurant-goer with an enticing experience that could put quite a few five star restaurants to shame. For those who can appreciate spicy, authentically appetizing comida at a reasonable price, On the Border is waiting for you.